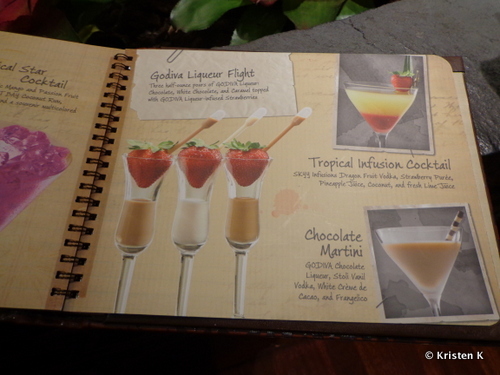 Last October I saw this cute little Godiva Liqueur Flight on Disney's cocktail menu. I had wanted to try them, but shots of anything really aren't my thing, in fact I can honestly say I had never before "done a shot" of any sort of alcohol. I was purely a sipping wine and cocktails sort of girl. However, I loved the look of the shapely little glasses, and the bright strawberries sitting on top appealed to me. Plus there's the interactive element of infusing the strawberries with the liqueur which just looked like fun. The Godiva Liqueur Flight is three half-ounce pours of GODIVA Liqueur in Chocolate, White Chocolate and Caramel. Each little glass is topped with a ripe strawberry that has a little pipette full of the liqueur sticking out of it. The idea is that you take the strawberry and squeeze the liqueur into the fruit therefor infusing the flavors into it. Well, it's a nice thought but the reality is a little messier. My companion for the night thought that it would be easiest if the strawberries are softer and almost overripe, but unless you get the pipette exactly into the open area in the center of the berry, it's just kind of messy. I decided not to bother further with the infusing process and just went with eating the delicious Florida berries followed by quick shots of the GODIVA Liqueur. Sitting in my favorite lounge with good friends over a fabulous evening somehow the cares of looking stupid doing my first shots faded away. I figured it's Chocolate Liqueur, how strong could it be. So down the hatch, one, two, three went the GODIVA shots! They were actually really good, they tasted like rich, creamy Godiva chocolates and alcohol flavor wasn't too strong at all. In addition I found the half-ounce pour to be a perfect size for a newbie. Of the three flavors I think the Caramel was my favorite because it just seemed to have a little more depth and interest to it. Disney's standard cocktail menu that can be found in bars and lounges across Walt Disney World property. Overall I thought this flight was charming and creative, even though the infusion process is difficult. It's absolutely something that I'll be ordering again and it would be a great cocktail to order with a group if people are wanting to try something special but don't really want to be doing any serious drinking for the night. 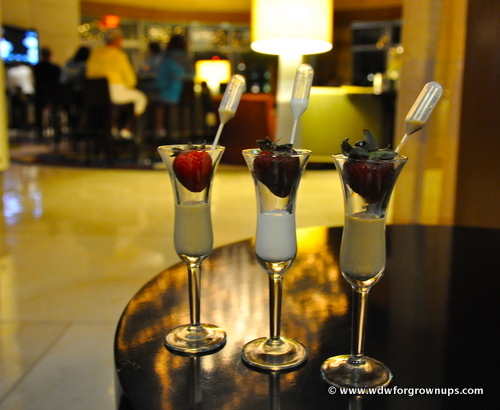 Have you tried the GODIVA Liqueur Flight from the Disney Cocktail Menu? Did you have any more luck infusing the berries than we did? Leave a comment and let us know! I'm sorry Tammy. Someone else picked up the tab when I was there so I don't think that I even looked at the bill. However, for budgeting most Disney Cocktails run somewhere between $8-$12. Emz - I had it at Top of the World, but it's on the standard Disney cocktail menu, so you'll find it in bars and lounges all over the property. I have had it at Captains Grille....it was amazing!! !